G20 Flagship Projects > Opinions > AI4Gender Inclusion? Thanks to its broad range of applications and fast-growing investment rates in R&D, Artificial Intelligence (AI) is one of the fastest growing technology fields. McKinsey predicts that AI could boost world output by $13 trillion by 2030, lifting GDP by 1.2 percent a year. AI development cycles are so fast that the next AI generation goes far beyond image and pattern recognition, and is able to cognitively capture and process unstructured, dynamic data sets and make decisions based on them. Some AI experts even claim that the impact of AI on humanity will be as revolutionary as electricity or fire. This AI enthusiasm has reached international development as well, although the debate of the topic is still in its early stages but with promising approaches for diverse sectors from health and governance to democracy and education. AI can improve efficiency by automating labor-intensive tasks, offers new insights through pattern recognition in complex datasets and supports the provision of quality education by enhancing learning experiences. In short, AI applications have tremendous potential for helping to achieve the SDGs, but the world is also facing new challenges through artificial intelligence and automation, such as job losses. The focus of this article is on the potentials and pitfalls of AI for realizing SDG 5 on gender equality. For tech optimists, the euphoria about artificial intelligence comes with huge promises for sustainable development. The rapid development of the sector holds huge potentials for women’s economic empowerment with an increasing demand for AI talents with new skills, among them knowledge about neuronal networks, deep learning and machine learning. Given the projected impact of AI on societies, the lack of women in the AI talent pool is a worrying situation: According to a 2018 study by the World Economic Forum, 78% of AI ​​experts are male, a gender gap three times larger than that in other industries. Moreover, once in the industry, female experts in the AI workforce are more likely to hold lower and less lucrative positions, such as data analyst or researcher. The statistics illustrate that the group, which in the future is supposedly responsible for the design of products in many areas of life, is even less inclusive than the tech industry as a whole, which has its own well-known diversity problems. The so called “white guy problem” of the AI industry is often cited as main reason for gender prejudices encrypted in code. Mostly female-voiced virtual assistants or discriminating job recruiting mechanisms are just two examples for manifestations of patriarchal stereotypes based upon AI. This is why addressing the shortage of women in AI workforce is not only an economic need, but it is also a matter of equality given the predicted influence of AI on economies and societies as a whole. For women and girls, achieving equity in education is an integral part of diminishing the gender gap around the world. Access to quality education increases women’s economic, social and political participation and equips them with skills enabling them to take an active role in the digital society. The relationship between AI and education can be considered at two levels. On the one hand, AI products can help improve education systems themselves in order to realize the SDG’s claim for inclusive and equitable education for all. AI solutions for education provide personalized and adaptive learning experiences and support to students, teachers, and administrators. 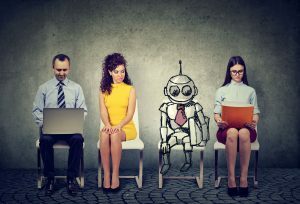 For instance, teacher bots – computing solutions for the administrative part of teaching, dealing mainly with content delivery, basic feedback and supervision, can relieve teachers of administrative work and give them more time for individual learning support. The development of AI systems for education e.g. AI-based tutoring systems and platforms can help to make education more accessible and inclusive. On the other hand, education also has a mission to fulfill when it comes to the introduction to technology and soft skills, as foundations for a career in AI and the tech sector in general. Socio-cultural stereotypes and a lack of gender-sensitive learning content and methods can manifest in a disadvantage for girls already at an early stage. A 2017 UNESCO study shows that girls appear to lose interest in STEM subjects with age, particularly between early and late adolescence. This lowered interest affects participation in advanced studies: The number of women studying STEM subjects has remained as low as 35% in the past 15 years. A lack of female role models in tech further exacerbates lack of female representation. Fortunately, there are already numerous initiatives and networks that are committed to encouraging girls and women to pursue an education and career pathways in the tech sector. Some of them focus specifically on qualification and networking in the AI sector (see examples below). The education sector must fathom out the potentials of AI for itself and at the same time be an enabler for the introduction into technology careers. Only then can it be guaranteed that women can reap the benefits of AI and are not sidelined by biased algorithms. Overall, AI is not the magic bullet for reaching gender equality, as technology is only as inclusive and smart as the people behind it are. To reveal the positive impacts AI can bring for gender equality, it takes considerate actions and awareness of the risks in order to ensure that AI contributes to equitable and empowering development and leaves no one behind. Women in Machine Learning (WiML) initiative: WiML works to enhance the experience of women in machine learning, and thereby increase the number and impact of women in machine learning. AI4All is a nonprofit working to increase diversity and inclusion in artificial intelligence. Ada-AI, a non-profit dedicated to ensuring AI benefits all. The initiative includes a global learning programme to educate under-represented countries and sectors of society in STEM education. AI Accelerator, based on webinars, panel sessions and social media discussions about Artificial Intelligence (AI), the purpose of AI Accelerator is to make AI more relevant to women and encourage more females into computing. The Federal Ministry for Economic Cooperation and Development (BMZ) is also advancing the discussion on AI4Gender Equality: The 2019 edition of UNESCO’s Mobile Learning Week will explore how Artificial Intelligence can accelerate the process of achieving SDG 4 under the theme “Artificial Intelligence for Sustainable Development”. On this occasion, BMZ and UNESCO will organize a workshop on “Looking at AI through a gender-lens”. The workshop considers strategies to establish stronger gender parity in the digital sector with a focus on AI – so that women and girls influence and shape the future of frontier technologies. Participants will discuss together with experts what the education of the future should look like and how cooperation with the private sector can help ensure that more young women in developing countries get employed in the AI industry.